During the Promień Żary vs. UKP Zielona Góra match on Saturday in Poland, home fans stormed the pitch and attempted to get to the away end. 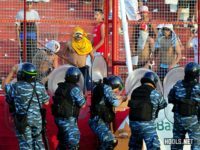 Lokomotiv Moscow fans clashed with stewards and police inside the Atatürk Olympic Stadium during Thursday's Europa league match against Beşiktaş. Fenerbahçe fans clashed with Dutch riot police in the centre of Amsterdam ahead of their Europa League match against Ajax on Thursday.